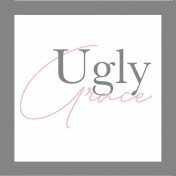 Ugly Grace – Page 22 – Because sometimes, God's grace in our lives, starts first with an ugly story. I like surprises. I always have done. They don’t have to be extravagant, budget-stretching surprises, but sometimes just an email to say, ‘thinking of you’ or a card in the post, can make the difference between a good day and a not-so-good day. Last week, I was feeling a bit rough and woke up one morning with a bad case of the dawdling doldrums…or the DDs. I laid in bed and thought grumpy thoughts for a while, but not surprisingly, that didn’t help, so I got up, made a cuppa and picked up a devotional I’ve been meaning to read for a while. That day’s reading was all about surprises and how God is a) not surprised when we are upset or stressed and b) He actually likes to surprise us with good stuff. I couldn’t find any exact theological evidence to back it up, but it made sense. God loves me, so it’s sort of logical that He’d do nice things. The challenge at the end of the reading was, ‘Ask God to surprise you today’. So I did. It was a fairly simple prayer (in the mornings, I am always VERY simple!!) along the lines of; ‘ I don’t mind what it is, but I’d love it if I could feel that sense of ‘awe’ again. Please could you surprise me somehow, today.’ Maybe it was a bit selfish, after all, I’ve friends who are suffering awfully at the moment, and that’s before I even begin to think more widely about the world, but in the depths of the ‘DDs’, I thought I’d ask for a bit of divine intervention anyway. The day ticked on and I actually forgot the prayer, till about 9pm when I logged into Facebook and nearly fell off my perch. There was a PM from an old friend that I had long lost touch with. It’s one of those friendships where you instantly click and though we’d only spent a couple of weeks together, sharing a house, we kept in touch. But time and distance had done their work and I think we’d last spoken about 8 years ago. But now here she was, in my Facebook inbox. Her message was even more special….she’d taken the day off sick and for reasons she didn’t understand, had been thinking about me. She said I’d been on her mind all day and she’d been praying for me…till in the end, she got online to try and find me. I worked it out; because of the time difference, at the point I was asking God for a ‘surprise’, she was sleeping, but when she woke up, I was on her mind. Bit overwhelming really, because to me it says that God cares about all of my small needs, as much as my big ones. He doesn’t always answer prayer the way we want him to and He definitely does it in His timeframe, but I think he always, always makes his presence known, often through little things like this. This sweet, unexpected message just reminded me that He’s got the details sorted. I love surprises….especially the God-kind. :). I first discovered running about 8 years ago. A friend told me that at first, I’d feel like a tractor was reversing over me; chest, legs, bum…everything would beg for mercy….but if I kept going just a teeny bit more, apparently, if I didn’t drop dead at that point, it then got pretty flipping good. So I tested the theory, I didn’t die…and whahey, turns out she was right, the endorphins are very, VERY flipping good! But being honest, much of the past 8 years has been, ‘run like a freak for 2 weeks’ followed by ‘not do much at all for 3 months’. But a couple of months ago, I decided that I was going to seriously push through the 2 week barrier and KEEP going. And so for the past month, I’ve been running around 30k every week and I’ve discovered this thing my friend Sara calls, ‘Runpeace’. It’s this moment, usually after the ‘I must be mad, I’m gonna DIE’ phase has passed, where I’m suddenly floating….and in my case, I feel like I can really, really talk to God. It’s even better if you happen to be running up a mountain (yes… I attempted Moel Famau in North Wales today!! ), surrounded by the very best creation has to offer. And today, I stopped to take a glug of water (and breathe…which helps in the whole staying alive business) and there it was; glorious sun glinting out from behind a line of spectacularly arranged clouds, lush, green valleys, not a soul or sound to be heard, other than the odd pitiful sheep bleat….and wow, it was like a tiny glimpse of Heaven. I was just overwhelmed by the beauty around me…no other word to describe it…and the peace and the feeling that me and God were up there alone and that He was listening to me…no one else…just me. So, I grabbed the opportunity and said everything out loud, that had been in my head…a sort of prayer mixed with thankfulness (and if I’m honest!) a bit of a whinge too! But as I stood there, and took in the view, I got my breath back and kept on jogging up the next bit. And the next bit of view was even more amazing. I felt a bit weepy that God had made all this, just for me to look at and enjoy…and maybe also to make me feel a bit more connected to him. At church recently, we sang the song which begins with the line, ‘There must be more than this….’. The Bible’s a pretty good guide for this kind of thing (ha!) and my brain flicked back to Paul and all that he endured for the Gospel. A few years back, I was in Malta in a place called St Paul’s Bay, which is the place where Paul was said to have been shipwrecked. There is a little stretch of land offshore, where a huge statue of Paul stands. I remember one day, walking along the shore and looking out at that statue and thinking about Paul’s ‘thorn in the flesh’ and how, in addition to that, he endured snake bites, threats of death, beatings, jail and so much more. He must have, at times, utterly despaired at all he was enduring for the sake of Jesus. But he could do it, because he’d simply had a glimpse of ‘more’. He knew, deep down, into the depths of his socks, that there was MORE, that it WAS worth dying for, being beaten for….he’d caught a glimpse of the glory of God and he was happy to give up everything in its pursuit. But, in my life, which is fairly comfortable, how do I get to the point of needing/wanting ‘more’? Why is it so easy to settle and be satisfied with my relationship with God, when the Bible says there is something literally ‘incomparable’ to be had. Why would I settle for anything less? At work, the radio is always on (tuned to UCB, of course!) and some days, I am so busy, I don’t really ‘hear’ it, but yesterday, I heard one of our regular contributors talk again about ‘surrender’. Probably just about the scariest thing you can ever do….and yet, it’s also pretty crazily liberating to chuck everything up in the air and say, ‘I can’t do it on my own….but I know I can, with the ‘more’ that God offers.